In order to keep pace with the changing complexity of financial world, ICAI has taken a step towards improvising the curriculum of CA course. New subjects will supposedly find their way into one of the toughest courses of the country. Institute of Chartered Accountants of India / ICAI is all set to give a thrust to the decade long course that has been framing up the future financial executives of the country. 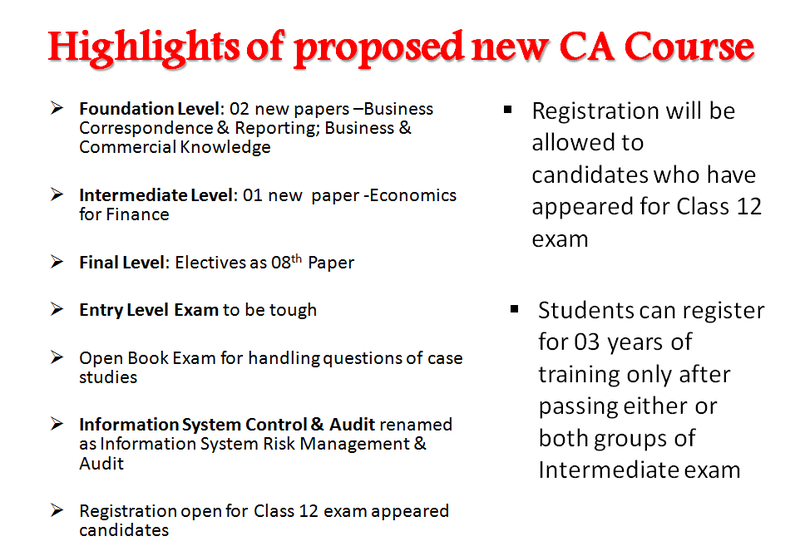 ICAI has approached the Ministry of Corporate Affairs to include new subjects into the CA course. Citing globalization and its effect on the chartered accountancy profession, ICAI President has stated that brushing up the existing course curriculum will help create better Auditors and Accountants for India. According to the proposed changes, the entry level exam will be tougher. Unlike present scenario, the registration for CA course will be open to those candidates who have appeared for Class 12 exam. These students can appear for the Foundation exam followed by a four month learning phase. Introduction of new papers at Foundation and Intermediate Level is the chief aspect of the proposal. While 02 papers have been suggested to add in Foundation Level, only 01 paper has been suggested for Intermediate Level course. The new course is ought to bring positive changes! Students those who join through Foundation course will take 4.5 years to reach their dream of becoming a CA. however students opting for direct admission will save a year in the process.